While FamilySearch has maintained its official policy of public silence about the continuing rollout of New FamilySearch (NFS), the online LDS Genealogy community was buzzing last week as members of about a dozen districts shared their excitement at receiving word they would get the New FamilySearch within 90 days. The map above shows in green the six districts already using New FamilySearch: St. Louis, Reno, Billings, Orlando, Albuquerque, and Alberta Cardston. I find it unlikely that the California Newport Beach district, for which I've heard no reports, will not roll out at the same time as the surrounding districts. The entire state of California may, indeed, be within 90 days of being on NFS. This will hit the new system with a huge amount of traffic. I've also shown Las Vegas and Bismark in red. Despite reports that NFS had been announced for these districts, I've not been able to confirm these. Likewise, Spokane, which reportedly was going to be #11 to go online, is shown in red. Baton Rouge may be in the same category, although I showed it in yellow. If any consultants (besides FHC directors) from these districts have received the notification email, please let me know! 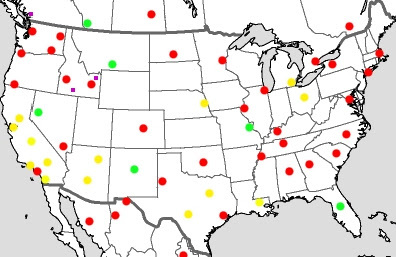 Purple squares indicate announced temples in the United States and Canada. If Las Vegas and Newport Beach are in the rollout process, then by sometime in February all the temples in these Western states will be online: California, Arizona, Nevada and New Mexico. Several states with only one temple are online or will be online by that time: Louisiana, Missouri, Nebraska, Montana, Ohio, Michigan and Florida. The Fresno Temple district had its official Priesthood announcement last night. The temple has been preparing and training personnel for several weeks. We received a “90 day notice” but it was more like a 60 day notice. As of now, we have a go live date of Dec 11th. Initially it was Dec 4th. The new FamilySearch requires a new recording system for the temples. There are a lot of new things to learn. We were told that Fresno was #9. FamilySearch is in version .9 with .91 due on November 15th. Basically it is still Beta. It is a work in progress with a few flaws but workable. Both large and small temples are in the rollout. They are still hoping to complete the process over an 18 month period. Members will be able register at the new FamilySearch soon after the "go live" date. Thanks for the info! Have you heard anything about California Newport Beach district? Keep us informed.